This Unit #3 is located on the second floor with balcony and views of Kalamazoo River. King bed in bedroom, 2 sleeper sofas in living room to sleep 6 total. beautifully landscaped with a view of the kalamazoo river. This was disappointing based on the amount that we were charged. Let me start with the positives. The pool was great. The kids had a fantastic time running between the pool and the hot tub. We brought a ton of pool toys and our group couldn't have been happier playing with them. We had all four units in the apartment building. To say that a unit sleeps 12 or 6 is comical; not sure that you could ever fit that many in one of these places. The building was in need of a deep cleaning and regular maintenance (boards from the deck were loose and kids were stepping on them). The unit we used had hair in the shower drain upon arrival and our friends found an acrylic nail in the bed. Guests are required to wash all of the linens/towel upon departing - and it's at 10:00 am check out. We stayed at the a Five-Star hotel in Downtown Chicago two weekends prior to this for close to the same amount per night. The prices that were charged were absurd for what you get. The kids came away with great memories; we came home and deep cleaned. A recommended property and full of disappointment. Pulled up to an over grown mess of grass, weeds and a for sale sign . The condo smelled like bleach so bad we had to open the windows and leave for a while. Upon returning and getting settled we noticed the dust and spider webs everywhere. The sheets were covered with dust and hair so we had to wash them before bed. The washing machine leaked. If you ran the bathroom sink to much, the water would fill up. The kitchen sink was backed up and the garbage disposal didn't work. So every time we turned on the water it would get clogged. We also didn't have any garbage bags and had to use our grocery bags. Oh and taking out the garbage was a disaster. Completely overfilled garbage cans. There was sand or something on the floors so we had to walk around with sandals on. we talked to other women staying on the property and they were disappointed as well.Also, having to wash all your towels and sheet before checkout at 10am is a little ridiculous as well as cost to stay at the property. Clean and well organized unit and it shares a fantastic pool and two hot tubs with the other units, so there was plenty of space to recreate and enjoy. Owners were quick to respond by text to questions. I'd stay in the complex again (I also visited the larger front house and it was similarly well organized). For our family of four, this was the perfect getaway location. The pool was great for small kids and the proximity to downtown Douglas, Saugatuck, and the public beaches could not be better. It's roughly 15 minute from Fennville as well so a trip to Crane's Orchard was easy. The ability to cook as family worked well for us too. We would definitely come back again. Our family has stayed here twice, once occupying all four condos with relatives. 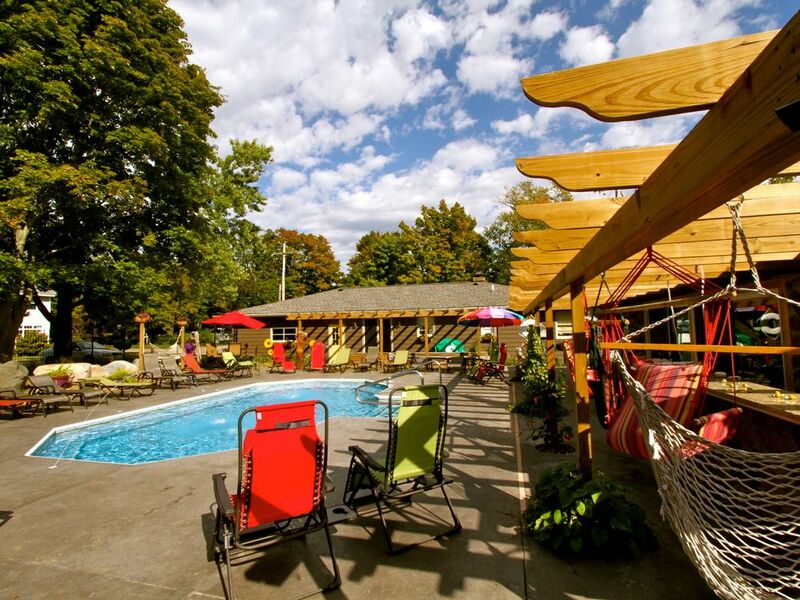 We really appreciate the resort-like pool and pool-deck and the location (quiet, but a very short walk to good restaurants, a grocery store, and a farmers' market, and a very quick drive to Oval beach or downtown Saugatuck). The units are clean and well-equipped, and the hideaway sofa-beds work well for our young children. The only negative: the mattresses are not the most comfortable for those who like their mattresses large and very firm.